(C) Julia Briggs for the English Tea Store. All rights reserved. 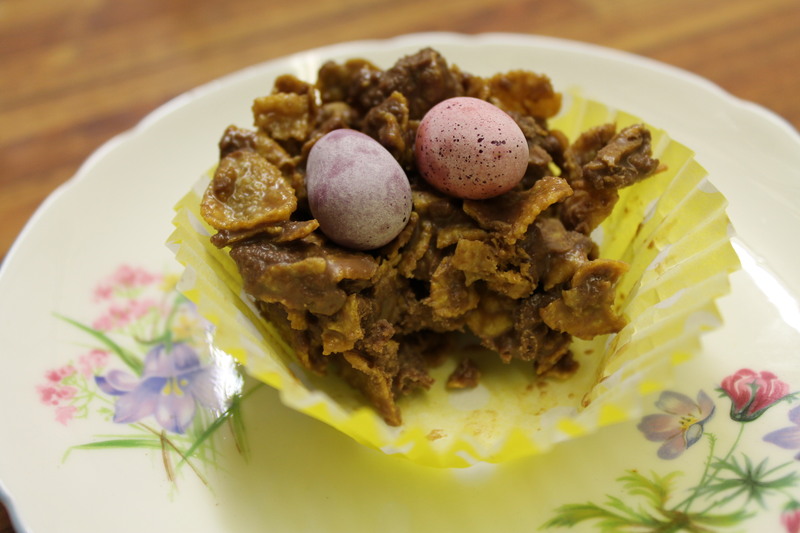 With the end of Lent we have Easter eggs and other such niceties and one of our favourites at this time of the year is Easter nests. They are so easy to make you can even get the children involved, although watch out for things being popped into mouths! My daughter loves to help with these but she like licking the bowls out best of all! No baking is required; they are just chilled in the ‘fridge when done. Break the chocolate into pieces and melt together with the golden syrup and butter, either in the microwave or over a pan of hot water. Stir until smooth, be careful not to get the chocolate too hot! Stir the cornflakes in until they are all coated in chocolate and divide the mixture between the 12 paper cases. Put the paper cases into bun tins otherwise they spread too much. Press three chocolate eggs into the centre of each nest (always assuming there are 36 eggs left!) They should resemble bird’s nests with eggs in. Chill in the ‘fridge for about an hour or until set. They keep well in an airtight tin but only if you hide the tin away from prying eyes and fingers – otherwise they will all be eaten on the same day that you make them!